Acrobranch is a fun, outdoor obstacle and activity course for kids, teenagers and adults that takes you through the Constantia Nek forest on swinging bridges, ziplines, Tarzan swings and treetop adventures. There are two courses dedicated to kids and one obstacle course for teenagers and adults. Kids from age 3 can participate. The age groups are age 3 – 6, age 7 and up, and the teenage and adult course has a minimum height of 1.4m. It is perfectly safe using harnesses with adult supervision. This is a great way to get the kids active outdoors and enjoying nature. Click here to read more. Create a masterpiece (or mess) on a blank canvas, while listening to funky music. 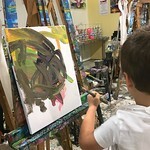 Artjammers are provided with a menu of 12 different size canvases, easels, a selection of non-toxic acrylic paints, brushes and tools to freely express themselves. Great idea for children’s parties! Art Jamming studios are located at the Cape Quarter, Cavendish Square, The Paddocks, V&A Waterfront and Willowbridge. Holiday classes available. See their website for details. An AMAZING indoor family fun park with a wide variety of activities to guarantee a fun time while exercising including a Trampoline Zone, an AltiGame, Climbing Walls and a huge Kids’ Maze, perfect for the little ones. Bugz Play Park is the largest indoor and outdoor play area in the Western Cape. The huge outdoor playground includes a train ride, quad bikes, rowing boats, jungle gyms, water slides, swing horses, horse rides, peddle carts, worm train, toddler tractors and a sand area for the little ones. The indoor area is suitable for children from 2 -10 and includes jumping castles, jungle gyms, slides, playhouses and a castle. Open daily from 9am – 5pm. Rides are only open on weekends, public holidays and school holidays. The City Sightseeing Bus is a fantastic way to see the city and some of Cape Town’s iconic attractions, and great fun for the little ones. This red open top, double-decker bus provides a hop-on, hop-off service to all the major tourist attractions. The City Sightseeing Boat departs every 20 minutes from the jetty outside the Two Oceans Aquarium at the V&A Waterfront and takes you on a 25-minute harbour cruise. Perfect for the little ones. There is even an audio commentary channel for kids! Click here to read more. This is tons of fun for all riding downhill on a sled at an outdoor toboggan track. This is the only toboggan track in Africa! The sled races down a 1.2 km steel half pipe. Children age 8 and above can ride alone while children under 8 need to ride with an adult. A sled can carry 2 people. Kids from age 3 can ride. Click here to read more. Open 7 days a week. Monday to Friday 11am – 6pm. Saturday, Sundays and Public Holidays 9am – 6pm. The magnificent Kirstenbosch Gardens is the perfect place for kids to learn and experience the best of nature, walk through the gardens and experience the Tree Canopy Walkway “Boomslang”, meaning Tree Snake, designed in the shape of a snakes skeleton. On exhibition in the Cycad Amphitheatre, and visible from Boomslang, is the amazing life sized Dinosaur sculptures made from tin, to raise awareness of the threats faced by cycads and their possible extinction. Very exciting for the littles ones. You are welcome to enjoy a picnic in the gardens. Moyo Restaurant has a play area. Click here to read more. An indoor trampoline park perfect for all ages. The wall-to-wall, interconnected trampolines will get your heart pumping and your face smiling. Inside the park there are over 17,000 square feet of trampolines, 2 dodgeball courts, 3 basketball lanes, a gigantic foam pit, 2 tumble lanes, a free-fall stunt jump foam pit, a battle beam and a fidget ladder. The Science Centre is a brilliant way for kids to experience Science in an entertaining and educational environment with over 250 hands-on exhibits and mind-boggling puzzles. There is so much to see and do your kids will be kept busy for hours having fun while being in a learning environment. Click here to read more. The aquarium displays over 3000 marine species including sharks, fish, turtles and penguins with large viewing windows. The displays are well laid out and presented with educational information on all species and raised viewing platforms for children. There is an interactive Touch Pool and a Microscope Exhibit offering a hands on opportunity to touch kelp, starfish, anemones and hermit crabs. The little ones will love the puppet show which takes place daily, three times a day at 10:30am, 1:30pm and 4pm downstairs in the AfriSam Children’s Play Centre, where they can also create artwork and play. Click here to read more.